It's a truism that doctors are difficult patients . One would expect doctors to make for ideal patients, but there are actually multiple reasons for why they are not ! I recently was ill because I had an abscess. My surgeon recommended that I get it treated by doing an incision and drainage . This is straightforward standard medical advice - that if there is pus, it needs to be surgically removed. However, as a doctor , I was extremely reluctant to undergo the surgical procedure. Now it's not that I'm scared of surgery or anesthesia , or that I have a very high tolerance for pain , which is why I kept on putting it off . It is just that sometimes I'm not really sure where the standard medical advice is necessarily the best way of doing things. While I understand the value of surgically removing pus, one of my concerns is that along with removing the pus, surgeon want to explore the infected tissue, in order to search for hidden pockets of pus, to ensure that they have completely removed sources of infection within the body. My worry is that this surgical disruption may hinder the natural healing process , and instead of helping the situation may end up making it worse. This is one of the reasons I was avoiding surgery , and have been quite enthusiastic about using alternative forms of medication, While I use antibiotics in order to localize the infection, and all the standard home remedies such as hot water for fomentation, I am quite willing to try various alternative medicines such as homeopathy , in order to localize the process , so that I can save myself from the surgeon’s knife . However, what about the patients who ignore the doctor advise and get better on their own ? They don't go back to the doctor and tell him that they no longer need his assistance ! This means the doctor never gets to follow-up on the patients who didn't follow his advice and got better , inspite of ( or perhaps because of) disregarding his medical advice ! A final personal observation. 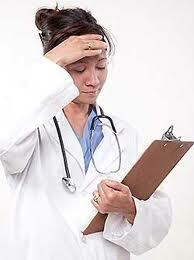 As a doctor , you tend ignore or neglect some of your own complaints. You tend to self medicate , and treat yourself , because you think you're extremely important in your patient's life and you don’t want to deprive your patients of your expertise . This means that when you are all, you tend to put yourself second , and focus a lot of your attention and energies on taking care of your patients, rather than taking care of yourself. This is not something which is very smart or something which I'm proud of ! What really tries a doctor's skill is when he himself gets sick. It's with these cases when the medical professional's coolness under pressure and focus are tested. Are IVF doctors overusing surrogacy treatment ? Free IVF comic book - become an expert patient ! Why are girls being abandoned and battered ? Why patients need to SPEAK UP ! Doctors deserve the patients they get ! Is a very busy doctor a better doctor ?